Looking for a fall light table activity for kids? Try this pumpkin themed math activity! Looking for an easy and inviting way to practice basic addition with your kids? 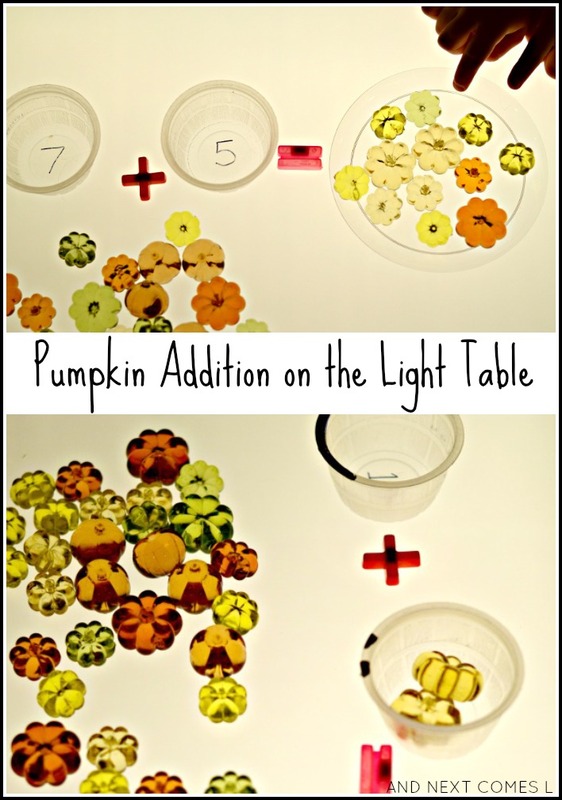 This fall-inspired math light table activity is a great way to explore addition in a hands-on way. Kids will love counting the pumpkins, dumping them onto the sum place, and adding them up! Clear cups - We recycled our applesauce containers for this activity. Addition and equal symbols - You could certainly draw them on the light table using a dry erase marker or window marker instead. Label the clear cups with numbers using the permanent marker (you can see them here). We had cups from 1 to 20. Then place two cups on the light table. Count the corresponding number of pumpkins into the cups. Then dump both cups onto the plate at the end of the math problem. Then count up all the pumpkins on the plate to find out the answer! Smaller kids will enjoy the scooping and dumping part of this activity, which is great for working on fine motor skills. I love how you used the plastic cups! Great idea! We reuse those plastic cups for everything!